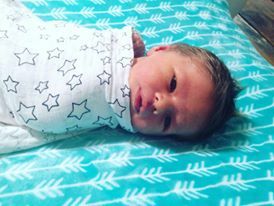 I just wanted to let you know how we went and thank you for your teachings which helped us have the strength and calmness to bring this little cutie into the world. I was 40w + 6d on Tuesday and was starting to get a little disheartened each day that he wasn't here! I was getting some cramps but nothing I thought was a contraction! I had been nauseous with pre labour symptoms for weeks but still nothing. On Tuesday afternoon the cramps had started stopping me in my tracks and I had been losing my mucous plug for 24 hrs so figured something was happening! I took the dogs to beach late arvo with Chris and had to stop every 8 mins to breathe through a cramp! I managed to get some takeaway and eat dinner before they started coming every 6 min for 40 sec. Chris started timing them, I paced around the house stopping in my tracks with each one and trying to breathe through it. I played my calming music in the background and the Rainbow Relaxation while Chris tried to read to me as I paced around. They got more and more intense and would take my breath away, I found it so hard to breathe for first 30 sec of it! We got in the car once they were 4 min apart but when Chris rang the midwife she said not to rush out and maybe have a shower to see if it calms them down! So back into the house we went lol. The shower only made them stronger and less than 3 min apart so within 30 min, we were back in car lol. Got to hospital at about 9 pm with my headphones in listening to the Rainbow Relaxation and stopping every 10 steps to try to breathe through another surge. Yolandi at the birth suite had already darkened the room and Chris set up the candles and put on the music. I kept my headphones in and phone attached in hand lol. I ended up on knees or standing/pacing trying to breathe through the surges most of the time, somehow I decided the toilet was the best place to sit and during a huge surge my waters broke over the toilet! I birthed him on the floor in the bathroom on my knees with my head on the fit ball. I wailed through about 8 surges trying to breathe him down, the pressure was so intense I felt I needed to take my time and not push. Instead, just waited for the next one (less than a minute rest in between was so tough!!!) to try again. I resisted asking how far I was along as I thought I'd run a marathon already and didn't want to be told I was further away than I thought! The midwife checked with the torch and Doppler to make sure he was ok and I managed to breathe him down with a lot of noise! Shaking legs - at almost 8Ib and no tears! Can't believe I did that!